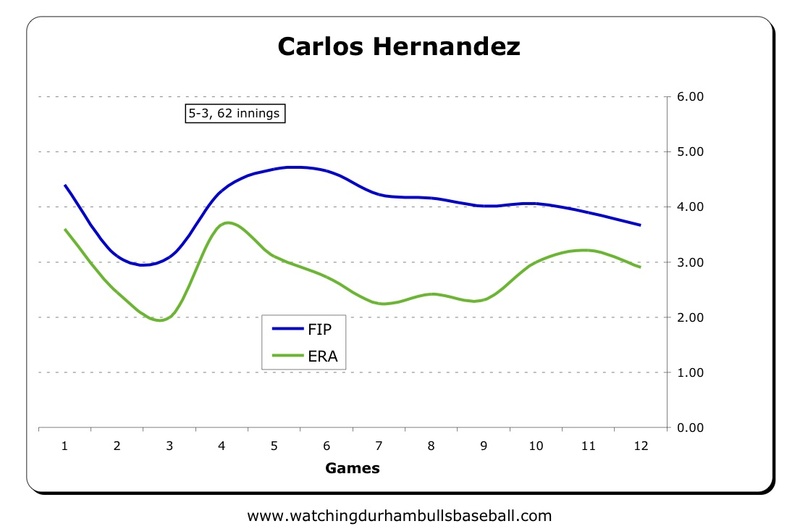 Bulls pitching has been superb in recent days, and Carlos Hernandez’s one-hit performance last night is a a good example. He had probably his best outing of the season and certainly the postgame comments recorded by reporters for the Herald-Sun and Indy Week show that all the team knew it. The Bisons only managed to get three base runners and the Bulls got their fourth shutout in 10 games. 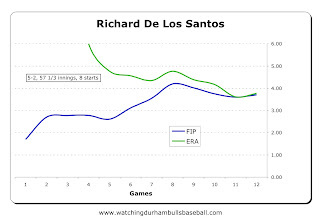 I should also correct a recent comment I made that Richard De Los Santos was our #2 pitcher numbers-wise. That simply is not the case. Sorry, Carlos. You are well established as our #2 and you showed it last night (but Richard is getting close). See the charts below for a comparison. Sobsey over at Indy Week has a good discussion of some of the statistical features of where the Bulls are this year. Wasn’t that a simply pretty night for baseball last night? The weather could not have been better for baseball, and the baseball was pretty too. Pretty, that is, except for the pink. I know, it’s all for a good cause, but the Bulls really didn’t look all that great in pink. Here’s hoping that the cause made a few zillion dollars off the jerseys, though. Joe Dillon was spotted in catcher’s gear warming up Joe Bateman. That’s gotta be a good sign if his hamstring can handle working out of a squat. Here’s a bit more information regarding Neil Solondz’s visit to the jukebox between the ocean and the bay down south. Adam Sobsey notes that former Bull Jason Childers is in town and promises an interview. Still trying to find out if Jon Weber has found a home. In the meantime, here’s a reflective piece on his career from a Yankees blog. Rays Prospects providing detailed coverage of the MLB draft. Please hurry back Neil. 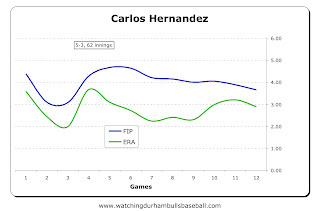 Herrera is beyond bad at play by play. 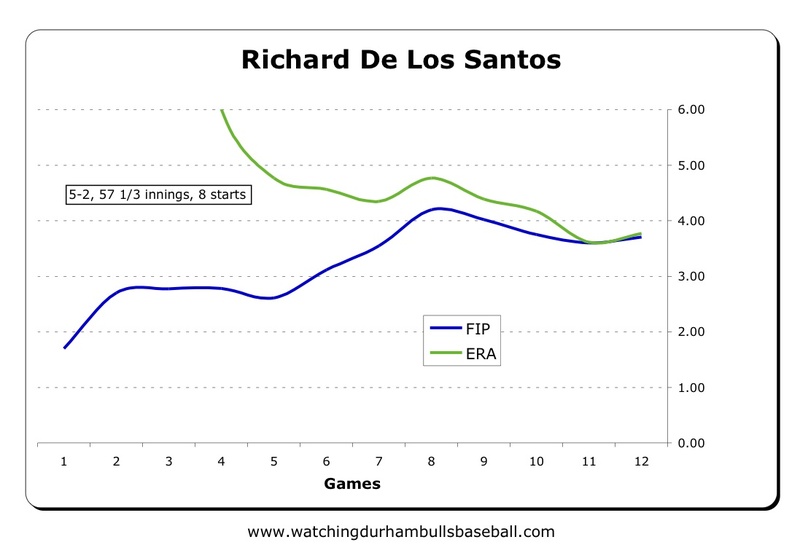 I still love Scott Pose, but it's amazing how unenjoyable a bad PBP guy can make a game. Agreed completely. I was worried when I saw the posts on the Rays blogs about how they were glad he was going to be gone for a few days, and apparently rightly so.